Southern California is getting a Lego/Brick Convention!!! About time!!! I just saw it posted from the good folks at FBTB.net that a SoCal Lego/Brick convention is coming in May!! I was tired of missing out on Bricks By the Bay and the Seattle con being so far away, but this is right in my own backyard! Southern Californians rejoice! I'm hoping it will turn out to be a long lasting con, so color me excited to check it out! Sigh, Pasadena is still a brick too far for me from down in the OC :(. Well there is always the Fullerton train show. There is always a big lego train layout there. ^ Thanks, will keep an eye out for the '15 show. I'm planning on going as I live 5 miles away from Pasadena. I hope to see some of you there! Reminder that BricksLA is this weekend in Pasadena!!! Who's all going? Anyone having any of their MOCs displayed? 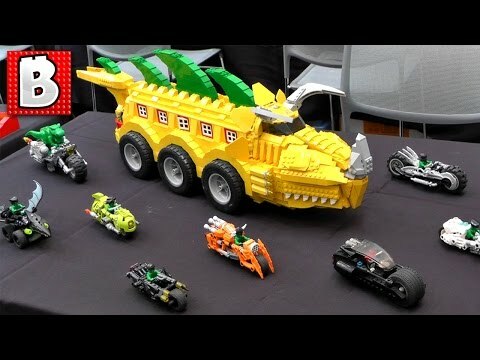 I didn't even know about BricksLA until it was mentioned this morning on another thread. Trying to get there tomorrow, hopefully have a chance to run into some Bricksetters if I do. Small taste of what was at BricksLA. ^It was a good show for my first BrickCon of any sort. I like the large mosaics (Matrix, Bttf), Mad Max theme, some impressive Mechs, nice cars like the Calypso, Jag & Bugatti, etc. Stopped by the Constructibles booth for a quick purchase for the gf (she was the one who almost lost her phone). Nice offerings of mini builds, of which she went with one of your Heart designs. Some of the booths were well priced, while others were shooting for the stars with their prices.